In an increasingly international marketplace, distribution and transportation have become critical factors to an organisation’s commercial success. Given its global nature, this is arguably one of the most complex functions within any supply chain. 10% of the world GDP is accounted for by distribution expenditures – in the case of commodities, this figure rises to as much as 25%. Even without drilling down into the minutiae, it is immediately apparent that distribution and transportation is an area which represents dramatic potential for savings. Customers, suppliers, ocean carriers, freight forwarders, customs brokers, government agencies… distribution and transportation is a process which relies on multiple cogs meshing and working together in an optimised manner. If one link in the chain is defective or wasteful, the knock-on effect in both directions can be highly damaging. For this reason, the open, transparent flow of information is a fundamental precept of Lean distribution and transportation. Enabled by technologies such as Transport Management Systems (TMS) and Radio Frequency Identification (RFID), an optimised, Lean model is characterised by the seamless, uninterrupted flow of information, shared amongst all tiers of the process. 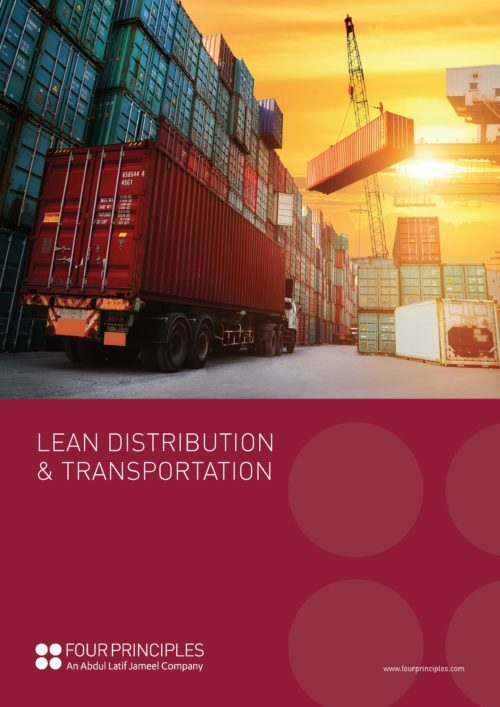 Applying Lean solutions that impinge on each of the contributory functions mentioned above, Four Principles bring end-to-end control, visibility and delivery stability to the entire delivery network. This is achieved by eliminating waste to increase inventory turnover, enhance the visibility, sharing and reliability of information through the supply chain and reduce lead times by optimising route planning. As a result, decreased lead time and reduced costs provide a solid foundation for long term, sustainable profitability – achieved in an optimised distribution and transportation network where not only goods but information flow seamlessly and unobstructed – from raw materials to the end-user.